If God is a God of Love, How Can He Send Us to Hell? How Can a God of Love Send Anyone to Hell? Most Christians would probably try and tell you that God doesn't send anyone to hell. That God gave us all a fair chance to follow Him and we make our own choice whether we follow Jesus or not and if we do not, then we are choosing for ourselves to end up in hell. This is only true to a point. Jesus does tell us that He is the only way to the Father. The Bible does teach us that if we do not accept Jesus, we will end up in hell. So in a sense, it is our choice where we end up. However, the truth is, God does still send us to hell. 14 Then death and Hades were thrown into the lake of fire. This is the second death, the lake of fire. 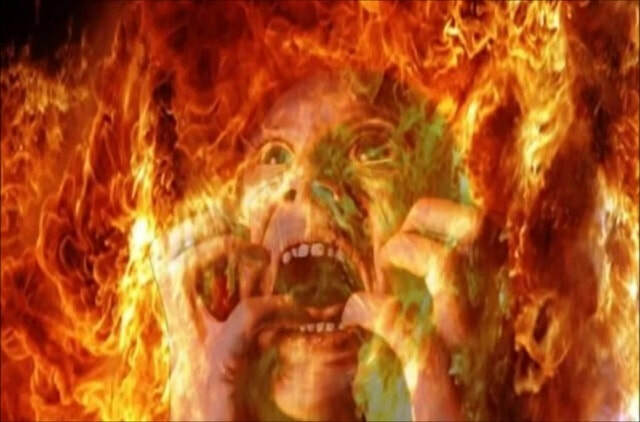 15 And if anyone’s name was not found written in the book of life, he was thrown into the lake of fire. It does not say we will fall into the lake of fire. It doesn't say we step, walk or leap into the lake of fire. It distinctly says we are "thrown" into the lake of fire. Whether it is God who throws us in or the angels doing it makes no difference. God still sends us there. Christians don't want to believe God would do such a thing either, so they tend to make up an excuse that we send ourselves to hell. What they don't understand is they don't have to make an excuse for God. He does throw us into hell and that is just simple truth. So why would a God who is supposed to be a God of Love send us to hell? Because he "is" a God of Love. Imagine if you will, you see your father who is an alcoholic about to kill your mother who has been loyal to you. A terrible thing I ask you to imagine, I know. Though your father is an alcoholic, you still love him because you have a lot of good memories from when you were little, but he is about to kill your mother and the only way to save her is to kill him yourself. Would you do it? Or would you let him kill your mother? Likely, as much as it would hurt you to do it, you would probably kill him to save her. That is why God will send people to hell. When Adam and Eve ate from the Tree of Knowledge, what did God do? He kicked them out of the Garden of Eden. Why? Because they had sinned and sin would corrupt the Garden. Sin is like the worst of cancers. It corrupts whatever it touches. Because every one of us sin, God had to send His Son to Earth to Die for us. So we could be washed clean of our sins. But he cannot wash us clean without us asking him to. It would do no good because if we don't give ourselves to God, we will only continue to sin. God has a perfect paradise set up for all of his faithful. A place that is untouched by sin. If God was to let everyone into that paradise, they would sin there as well and corrupt his paradise. Destroy that perfect place for all of the faithful. In time it would destroy his faithful as well. The only way God can promise us an eternity in a perfect paradise is if he keeps it free of any sin. So God sends His Son to die for us so we might be washed clean of our sins. But we have to turn to God and ask Him for that forgiveness. We have to have faith in Him. Everyone who does is washed clean and will be allowed into that uncorrupted place. But the only way he can keep it perfect for his faithful is if in the end, he cleans house and rids us from the corruption. God loves everyone. He loves his faithful and his unfaithful alike. But He will be true to His faithful and just like we would be willing to kill the alcoholic father we love in order to save the loyal and loving mother, God is willing to cast the unfaithful he loves into hell to save the faithful. God will never cast one single person into hell out of hatred, anger, or any kind of evil reason. He will cast each one into hell and suffer the pain of doing that to someone he loves and He will do it out of love. He will do it out of love for his faithful. Yet in the end, though God is forced to do the dirty work and suffer through it, not one of those souls will be able to blame Him. Each person who is cast into Hell will only have themselves to blame. Because God is not going to send anyone to hell without giving them a fair chance to accept Jesus as their Savior and be washed clean of their sin. Everyone, by the time that day comes, will have a chance to make their own mind up. And if we choose not to serve God, then we are choosing to be cast into hell. We make the choice and God does the dirty work, but He does it out of love for his faithful.